An amazing testimony from a young man whose courage and faith has enabled him to overcome incredible adversity. Nicholas Vujicic's message of hope and encouragement is rooted in the wonderful things God has done, and continues to do, in his life. Truly inspiring viewing. Imagine getting through your busy day without hands or legs. Picture your life without the ability to walk, care for your basic needs, or even embrace those you love. 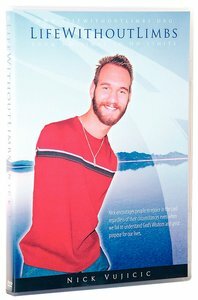 Meet Nicholas Vujicic (pronounced VOO-yee-cheech). Nick was born in 1982 in Melbourne, Australia, without arms and legs - a rare condition known as phocomelia. Before his birth, three sonograms failed to reveal complications. And yet, Nick's parents Dushanka and Borislav were destined to cope with both the challenge and blessing of raising a son who refused to allow his physical condition to limit his lifestyle. The early days were difficult. Throughout his childhood, Nick not only dealt with the typical challenges of school and adolescence, but he also struggled with depression and loneliness. Nick constantly wondered why he was different than all the other kids. He questioned the purpose of life. Nick has two vestigial feet, with one of which he learned to operate a wheelchair, computer keyboard, and mobile phone. He was able to graduate from Griffith University at 21, with a Bachelor of Commerce degree. According to Nick, the victory over his struggles, as well as his strength and passion for life today, can be credited to his faith in God. His family, friends and the many people he has encountered along the journey have inspired him to carry on, as well. Nick holds to a born-again faith in Christ and to the truth of the Bible as God's Word to man. Since his first speaking engagement at age 19, Nick has travelled around the world, sharing his story with millions, sometimes in stadiums filled to capacity, speaking to a range of diverse groups such as students, teachers, young people, business professionals and church congregations of all sizes. Today this dynamic young evangelist has accomplished more than most people achieve in a lifetime. He's an author, musician, actor, and his hobbies include fishing, painting and swimming. In 2007, Nick made the long journey from Australia to southern California where he is the president of the international non-profit ministry, Life Without Limbs, which was established in 2005. In 2012, Nick married Kanae Miyahara, and they make their home in California with their two sons. Nick says, "If God can use a man without arms and legs to be His hands and feet, then He will certainly use any willing heart!"